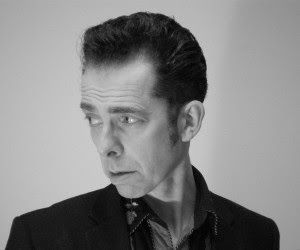 Today’s guest blog is by musician, journalist and author Max Décharné. He is the author of a number of books but my favourite is Straight From The Fridge, Dad: A Dictionary of Hipster Slang. 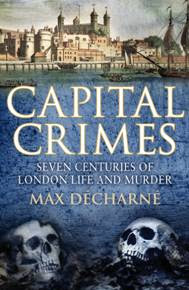 His latest book Capital Crimes- Seven Centuries of London Life and Murder is published today. My new book, Capital Crimes – Seven Centuries of London Life and Murder, is a leisurely stroll through the life and homicidal history of the city from the Peasant’s Revolt of 1381 up until the 1950s, when the movement for the abolition of hanging was about to achieve its goal. I’ve written about crime before. My book Hardboiled Hollywood – The Origins of the Great Crime Films (2003) dealt with a combination of classic crime novels, crime films and a certain amount of true crime, while my slang dictionary, Straight From The Fridge, Dad (2000), was riddled with underworld expressions drawn from real life, film noir, pulp murder mysteries and other related sources. Capital Crimes, however, is something different. My publisher at Random House was interested in the changing face of murder cases in London down through the ages. I had covered a fair few US historical murder cases in Hardboiled Hollywood, so it was nice to approach a selection of homicides that happened much closer to home, in the city where I live. What also attracted me to the subject was the chance to write about changing life in London as the capital grew from a population of roughly 30,000 people to eight million over the course of seven centuries. I did not particularly want to focus on the lives of dead kings, queens, aristocrats or politicians – although inevitably there are a few of them in the narrative. Instead, I was trying to conjure up everyday experience of the vast majority of the population of London as the city overflowed its original walled boundaries and successive changes occurred. The advent of newspapers in the 17th century; the founding of the Bow Street Runners in the mid-18th century; the River Police in 1798; the Metropolitan Police in 1829; all mixed in with innovations such as the railways, the telegraph, fingerprinting, telephones, motor cars, and then all the complexities of modern forensic sciences. Each chapter is centred around one real-life murder case – the killing of a Moorgate pub landlord in 1695, or a Shoreditch lovers quarrel turned bad in 1887 – while building up a picture of life in the capital during that era. Five hundred years ago, if you killed someone in London, who would be around to catch you, and how would they prove your guilt? Justice was random, swift and inaccurately applied. Even in the 18th century, murder trials at the Old Bailey could be done and dusted within an hour or less, and the gallows at Tyburn must have claimed a fair few innocent victims of circumstance and hearsay. Labels are inadequate, but if you said that I write about popular culture, you would be somewhere near the mark. To clarify that, I am interested in trying to make sense of what is already long gone. I think too many films and books present a view of previous decades as if things back then were exactly the same as today, with the people just wearing funny clothes, which to me is nonsense. I’m with L.P. Hartley on this one, ‘the past is a foreign country: they do things differently there’. You have to try to understand the mindset and respect the differences involved. At first glance, you might think that my books are sometimes quite different from each other. Obviously, the main link between them as far as I am concerned is that they are all about subjects, which interest me, and which I hope will interest other people. My last book, A Rocket In My Pocket (2010), was a history of rockabilly music, so I’ve gone from discussing the Memphis music scene circa 1955 to quoting Old Bailey trial transcripts from the 1690s, but to me it all links together. How did it feel to be alive in that time, and what were the ordinary people doing while those that were supposedly running the place were squabbling about all manner of things whose importance has often faded away to nothing with the passing of the years? Many people in the UK these days would struggle to place the name Herbert Henry Asquith, but back in 1910, as prime minister, he was leading a government that ran the largest empire the world has ever seen. However, if you mention Dr. Crippen – hanged for murder at Pentonville that same year – it is likely you will meet far more cries of recognition. I didn’t write about Crippen in Capital Crimes, because that particular story has been covered many times elsewhere. Indeed, while I included one or two better-known cases, I mostly tried to choose less familiar examples. The social history element weaves in and around the criminal detection stories, so the book is not just a parade of gory details – although several of the victims certainly met their ends in brutal ways, such as the dismembered 1836 corpse found scattered to the four winds in a chapter entitled East Side, West Side, All Around The Town. I have to say though that it was not the blood that interested me, but the life of the city through the centuries, and in particular its underworld. Right now, I’m half-way through the writing of my next book, which is again non-fiction, and takes me back to the world of colloquial language like Straight From The Fridge, although it is not a dictionary. If at first sight this might sound like a shift away from all things criminal, that really isn’t the case, since a vast amount of the really entertaining and durable expressions in the English language has come not from occupants of Mayfair drawing-rooms but from the shady gentlemen more likely to be found climbing through the recently-broken windows of such establishments at 3.00 o’clock in the morning. Once again, my real subject is the past, rather than the present, and the entertainingly frayed edges of society, which exist a little bit past where respectability ends.